daylesford organics: Crimes of Farm Fashion Part 1. Crimes of Farm Fashion Part 1. 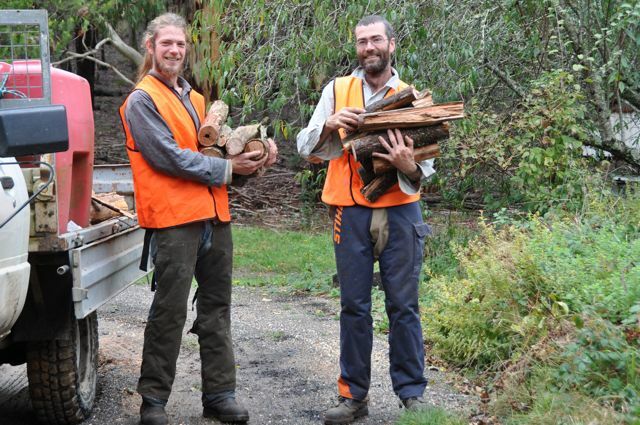 I'll be back as soon as I get over those fluoro vests to tell you about the other fun stuff that's been going on here at Daylesford Organics lately. There's been honey collecting and spinning (possibly another fashion crime), preserving, 600 baby chickies, carrots, apples, beetroots and all sorts of other fun farm stuff. ps stay tuned for baby chicken live cam. You know the term 'blue collar workers'? Now I think it should be retermed as flouro workers, such marked is the emergence of hi vis work wear. well at least you won't lose them. i'm with alison - i always have flashes of chipendale cowboys when i see a man in chaps ! hmmm love the smell of a chainsaw in the morning . . . bring on cosy woodfires, stovetop casseroles and a slow simmering kettle ready for cups of tea. I have enjoyed reading your articles. It is well written. It looks like you spend a large amount of time and effort in writing the blog. I am appreciating your effort. .
We are a Certified Organic mixed family farm in Daylesford Victoria. We focus on sustainability and biodiversity. We have orchards, market gardens and chickens. We work with the seasons and in any given year will produce up to 40 varieties of apples, hazelnuts, berries, free range eggs and up to 30 different vegetables often with several varieties of each. We specialise in growing heirloom varieties with lots of different flavours and colours. We sell our produce to local cafés and restaurants, at farmer's markets and at our recently opened farm gate stall. Visitors to the stall are able to experience first hand where and how their produce is grown, talk to the growers and buy the freshest, just out of the ground produce. Comments, feedback, enquiries? Please send us an email.